oth bands come from Wisconsin, and play the kind of melodic punky rock that evokes cold winters and kids packed into smokey basements with a few cases of cheap beer. Their excellent songwriting combined with a refreshing earnestness really makes these bands stand out. To me there is a lot of continuity between the modern machines, the fragments and their geographical antecendents, Husker Du and the Replacements. Check out the mp3's and decide for yourself. 6 songs from each band, with alternating tracks. 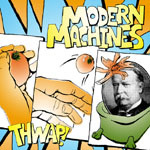 he modern machines return with their very own full length. These guys play catchy punk rock to perfection, following a clear influence from the early replacements and husker du. Full of energy, rock power and diy attitude. They tour constantly, so keep an eye out for them in your town.